A Traditional New York Style Cheesecake Recipe, with a twist! 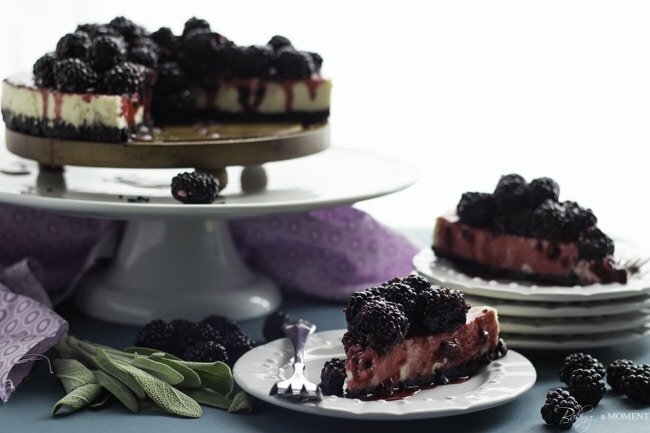 A few ounces of Goat Cheese add a distinctive Tangy flavor to this Rich and Creamy Dessert Recipe, and a Crunchy Chocolate Cookie Crust and fruity Blackberry Topping take it to a whole new level! Plus tips on how to avoid a soggy crust. 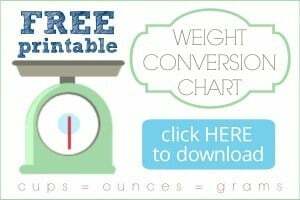 Oh my gosh, am I ever excited to share this post with you today! As soon as I was invited to participate, I knew I wanted to make something with goat cheese. I have made no secret about my love of all things goat. Remember this cajeta? <–It’s goat’s milk caramel and it’s seriously to die for. I just can’t get enough of the creamy, tangy stuff! One of the things I love so much about goat cheese is that it works so well in both savory and sweet dishes. To complement all the creamy goodness, I chose to top my cake with a quick blackberry compote. This is such a great time of year for berries and I wanted to be sure to get at least one or two good blackberry recipes on the blog while they last! Now here is where I might lose some of you, if I haven’t already with all the goat talk: Sage. Blackberries and sage are a match made in heaven. It only takes one little sage leaf (keep it subtle) to bring this topping to a whole different level! All together, the flavors of goat cheese, blackberries, and sage, along with this chocolate-y cookie crust… it’s like, cue the choir of angels! Speaking about crust, I used Famous Wafers here but you could also use crushed up Oreos or Oreo crumbs, if you can find them. If all else fails, my dark chocolate graham cracker recipe would be perfection! Spray the pan with baking spray. Line the pan with a circle cut from parchment paper. Allow the baked cheesecake to chill overnight in the fridge before turning it out of the pan. Run a thin knife around the perimeter, to loosen. Warm the outside of the pan with a hot, damp kitchen towel. Flip it upside-down onto a plate. Flip it right side up onto a serving platter. A Traditional New York Style Cheesecake Recipe, with a twist! 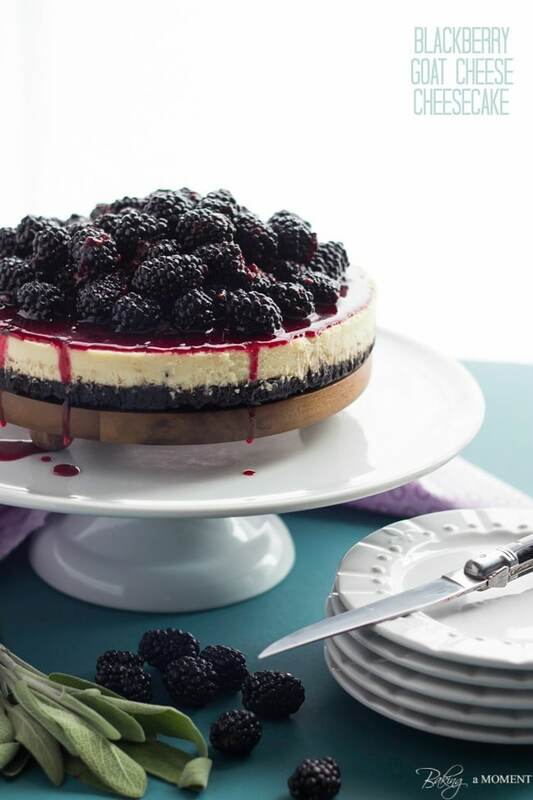 A few ounces of Goat Cheese add a distinctive Tangy flavor to this Rich and Creamy Dessert Recipe, and a Crunchy Chocolate Cookie Crust and fruity Blackberry Topping take it to a whole new level! Place the Famous Wafers in the bowl of a food processor and process finely. Add the melted butter, brown sugar, cocoa, and salt, and process until well mixed. Finely mist an 8-inch diameter cake pan with non-stick spray, and line the pan with a circle of parchment. Press the cookie crumb mixture into the bottom of the pan. Place the cream cheese and goat cheese in a large mixing bowl, and beat until creamy. Add in the sugar and whip until fluffy. Add the sour cream and vanilla, and mix until smooth. Scrape the bottom and sides of the bowl, and mix once again to be sure the batter is not lumpy. Pour the batter into the prepared pan, and place into a larger baking dish. Place in the oven and fill the larger dish with about an inch of water. Bake for 45 minutes or until set in the middle. Leave the baked cheesecake in the oven, oven door propped open with a wooden spoon, for about an hour or until the cheesecake is completely cooled. Refrigerate overnight before removing from the pan. Place 1 cup of the blackberries in a small pot with the sugar, water, and cornstarch. Bring to a boil, then reduce to simmering and cook for about 5 minutes, or until thickened. Mash the berries, add the sage, and allow to steep until slightly cooled. Remove the sage leaf and stir in the lemon juice. Pour the mixture over the remaining berries and toss to coat. Spoon the compote over the cheesecake. I’ll be talking to you again on Friday; my good friend and blog designer Lisa from Sweet2Eat Baking was kind enough to create a lovely guest post for me, while I scramble to get caught up again after my whirlwind travel tour last week. You guys are going to love what she made for us! I love goat cheese anything and have made a goat cheese before, but you totally got me at sage and blackberry! Sounds so amazingly good! Thanks for joining us, Allie! This cheesecake looks absolutely amazing! The blackberries on top…. to die for! That is seriously one beautiful cheesecake my dear! Thank you Jocelyn! That means so much coming from you; everything you make is gorgeous!!! This is stunning!! I love the photos!! Thank you so much, Aimee! I had so much fun with it. So happy to be a part! I’m getting ready to make something with blackberries and cream cheese today. So what an inspiration here Allie! Allie, this looks like everything good in the world! What a perfect combination of flavors. And, girl, you own GIFs! Thanks sweetie, but I don’t think I will own gifs until I get photoshop instead of relying on this ghetto app I’m using that makes everything grainy and dark. Lol! It’s probably about time I get off the pot and just go for it! Seriously impressive. I love that you baked it in a cake pan. I’ve pretty much thrown in the towel with big cheesecakes and stick to muffin pan size, but maybe I’ll try again. My issue wasn’t so much the crust as always getting a crack in the middle of the cake… even with water baths, etc. This is such a beautiful cake and I love the flavor combo. Pinned! Thank you Jill! I don’t know how I managed to avoid the dreaded cracked cheesecake- just got lucky I guess ;P But that’s what berries are for anyhow, right? Thanks so much for pinning my dear! I would LOVE to try the goat cheese in this. Yum. Oh, I really love it, Carolyn! So delish with the berries… Thank you so much for stopping by and for the sweet comment! I’m having a blast meeting so many awesome bloggers through this fun event! Your cheesecake is gorgeous and looks so luscious! Love the animation! I’ve made a goat cheese cheesecake before, and I was pleasantly surprised at its deliciousness. Now topping with blackberries makes it even better! Another stunning dessert, Allie! Simply stunning! I love your cheesecake!! Oh I’m so glad to hear I’m not the only goat-cheese lover! I find it totally irresistible, especially with berries. Thanks so much for stopping by Heather, and for the sweet comment! Oh brother, that has me drooling!! Lol thanks Tara! So glad you dropped by and thanks so much for the great feedback! Lovely! I bet the goat cheese + blackberries go really well together here! Oh my, goat cheese lover at heart! Swooning over this! Yay I’m so glad! I was a little worried that some people would find it too weird, so thank you! I’m really happy you like it. Thanks so much for stopping by and for the sweet comment, Lisa! Wow, Allie, this cheesecake is stunning! Seriously gorgeous! And I love the flavors you used – so unique and interesting. 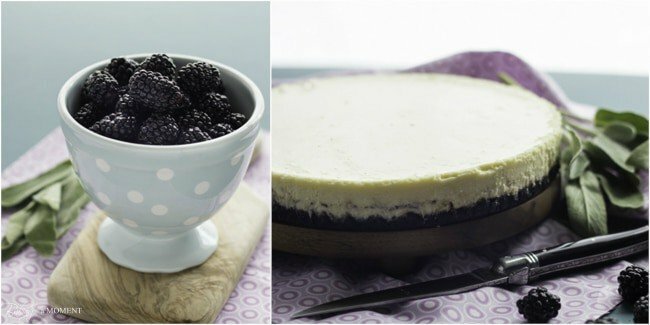 Great tips on the crust too – I still haven’t made a real cheesecake so I will definitely need all the help I can get when I make my first attempt! Happy Cheesecake Day! Yup, I think I’m going to bake my cheesecakes in a cake pan from now on too. No matter how tightly I wrap the cheesecake pan, water from the water bath ALWAYS seeps in. This is gorgeous, Allie. Absolutely stunning. I’m not a fan of goat cheese (gasp, faint – I know!) but your cheesecake looks perfect. I love the big delicious pile of ripe blackberries on top. It’s ok Nancy- I knew that goat cheese would probably be polarizing 😉 But you’re so sweet anyway, and yes- the foil trick is completely useless! I’m so over it. This cheesecake could not be more gorgeous! 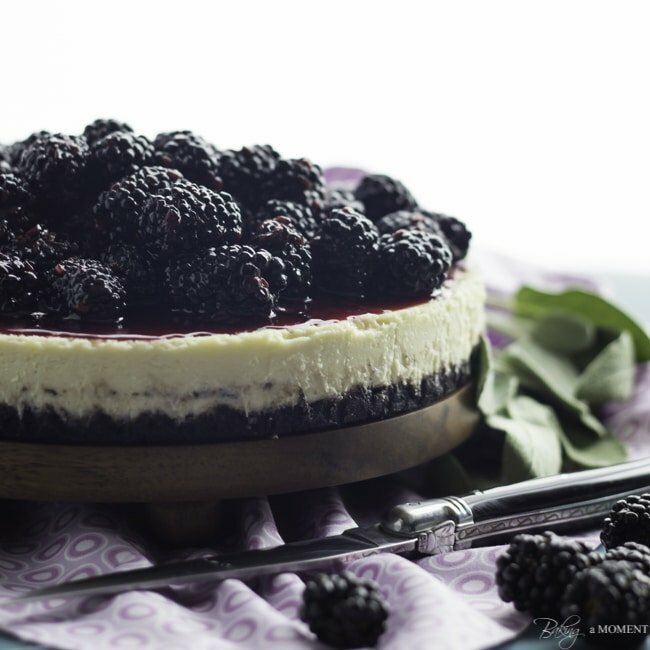 I actually have blackberry cheesecake on my to bake list, and now seeing your pictures, I want to move it to the top! Pinned! That looks gorgeous! I bet blackberries and goat cheese taste amazing together! Oh, they really do, Coleen! You should definitely give it a try 😉 Thank you so much for stopping by and for the sweet comment! Whenever I see sweets with herbs and spices in them, I know I am going to love it. This cheesecake is the real deal, Allie! I love your tips for keeping the cheesecake from getting soggy, too! The goat cheese with sage/blackberry compote would be a fantastic flavor combo for a cheese plate too. I’ll have to keep that in mind! Oh, my double goodness, Allie! Goat cheese is an absolute favorite in our house for sweet OR savory but I’ve never thought to use it in cheesecake. You are a genius! Wow thanks so much Stacy! I’m so glad to hear that you like goat cheese because I am totally in love with it. It was awesome in this cheesecake, but I really can’t take too much credit because the filling recipe was by Ann Burrell. Girlfriend knows what’s up! Anyways thank you so much for stopping by and for the sweet comment! gorgeously stunning. . as always!!! love this, Allie! Cheesecake is my favorite food ever, and this day is the best day ever except that I didn’t know how to participate with y’all! I’m just drooling over my computer instead. I hope to be a part next year, and love this recipe!! Oh ya definitely try to join up with us next year, if Roxana decides to organize it again! Do you know Roxana? Her blog is Roxana’s Home Baking- it’s awesome! Thank you so much for the sweet comment, Shikha; I’m so glad you’re enjoying Cheesecake Day! Stunning! This is such a brilliant cheesecake. I love the goat cheese and blackberry combination. This sounds like a very interesting cheesecake!! I must try it! Wow! This cheesecake is truly a stunner! Blackberries and sage – Amazing!! Great tips on preventing a soggy crust. Thank you so much Mind Over Batter! And ya I am so over the leaky springform pan thing. Even with foil it never works right for me. This was way better, lol! Thanks so much for dropping by and Happy Cheesecake Day! What a gorgeous and mouthwatering cheesecake — made from goat cheese, a real fave of mine. This is geni-fabu-awesome-lous, Allie! Goat cheese sounds like a fantastic winner in my book. So glad to be celebrating cheesecake day with you today! I seriously gawked at this when I first saw it yesterday. This is amazingly beautiful and it looks so juicy too (is that kinda weird that I said that). Whatevs. It’s great Allie. Bravo!! Wow! What a stunning presentation! Love the blackberries piled on top! Thanks Maebells! When it comes to berries, more is more, IMHO 😉 So happy you enjoyed, thanks for stopping by and for the sweet comment! Thanks Arpita! I was playing around with backlighting and I was pretty happy with the way it worked in this instance 😉 I’m so glad you liked it too! Have a great weekend ok? Ooooo I love that you used goat cheese in here! I keep meaning to use it in desserts but just never remember! And with the blackberries … this looks awesome Allie! Thanks Ashley! I was afraid that some people might think it sounded weird but it was so good! Very subtle but just different enough 😉 I’m so happy you liked it! Have a great weekend, my dear! Fantastic cheesecake, I love that your made it using some goat cheese and then the sage in the compote is nice too, great photos! I can’t even put into words how amazing this cheesecake looks and sounds. Goat cheese AND blackberries..YUM! Goat cheese cheesecake is just a fantastic idea. Actually, goat cheese in ANYTHING is fantastic. Pinned! I love the addition of goat cheese Allie – so smart! And I totally want to try this in a cake pan – I bet it’s tons easier 🙂 Pinned! Thanks Trish! I definitely thought it was easier. No matter how much foil I use, I can never get those springforms to not leak! First of all, that photo belongs in a frame up on the wall because it’s stunning. Second, this is so happening in my kitchen ASAP because I’m obsessed with goat cheese and with adding herbs to fruit. Love, love, love! WOW. I am so impressed with this cheesecake! I think the goat cheese, sage, and blackberry combo is so creative and sounds delicious! GOATS CHEESE IN A CHEESECAKE?! Girl, you crazy but genius!! Why did I never think of this before?! Ahhh drool!! My 2 favourite ever things in ONE tin D: Looks incredible Allie! Goat cheese is one of my favorite cheeses ever, yet I don’t think I’ve made a cheesecake with it. Can’t wait to get my hand on some fresh berries and try this. What a stunning dessert! I love fresh blackberries, and you sure hit it right out of the ballpark! This cheesecake looks phenomenal! I love the berries on top! Don’t think about trying this recipe, JUST DO IT! Amazing recipe and not that hard to make. Was a big hit. Modified it to include less sugar (only used brown sugar) and it still tasted great. Allie, you are an expert and will gladly try another recipe from your site! Beautiful cheesecake! Such a fantastic flavor as well. Goat cheese is a winner! !